How Can You Build a Garden Log Cabin Easily? Garden log cabins are more popular in the UK as they have ever been. Probably due to their pleasant appearance that fits so well into the backdrop of the garden, their versatility and the huge supply of all possible styles, sizes, floor plans and designs by a number of professional manufacturers it is easily possible to find the perfect garden log cabin for whatever usage you may have in mind. 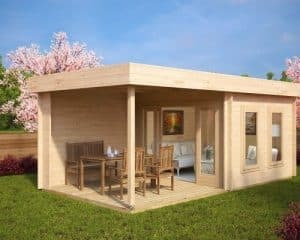 If you need a garden office, a workshop, a garden lounge, a holiday cottage, a garden room for storage or for gardening, a garden sauna, spa, gym or one of the many other popular usages, a garden log cabin with just the right properties can easily be found on the internet. To achieve a long lifespan some treatment of the wood is necessary some of which we already perform before you even get your new garden log cabin delivered, and some others can be done by you. A garden log cabin does not need a lot of work to be maintained perfectly. Log cabins need about the same amount of time and effort as any other house, and one could argue probably even less. Of course the main target is preserving the wood. A living tree cares for itself, but with the felling, this duty is handed over to us. Water, sun, frost, fungi, insects are some of the threats. Changes in temperature and moisture may cause the wood to shrink or swell and that’s basically the whole lot. On the plus-side:We know how to treat our logs and there are thousands of manufacturers of wood-protective products and systems that shield the wood perfectly so that the difficulty is more with the choice of the system than with the protection itself. For our garden log cabins, we use durable and firm Northern Spruce. Other than Spruce in warmer regions, Northern Spruce grows very slowly and becomes quite dense and durable. Water is the basic element for life of all kinds from fungi to insects. Our logs are kiln-dried to 18% of moisture before the processing at the factory. This is for conservation purposes, but we also achieve a conservation of the form of the parts that will usually not shrink because 18% is an average moisture in most climates. The timber will just stay at that level of moisture and the garden log cabin will keep its original size. Foundation planks and underfloor are often exposed to moisture from the ground and after the assembly, they are no longer accessible for inspection and further treatments. Thus, we pre-treat these parts professionally in our manufacturing plants. At this point it is on you to decide for a treatment plan for your garden log cabin that fits your needs, and that you will usually follow through with for the foreseeable future. Will you need to apply a stain to protect against UV? Will you use a colour? Will the paint be water-soluble, like acrylic paint or oil based? Will you use a treatment that will be soaked up by the wood and protect it from inside? And if so, will you put a layer of impenetrable lacquer on top? Staining with borate-based wood treatments will protect your logs from the inside-out and this is a possible application for an effective protective treatment before the assembly. This way you will be able to treat each part from all sides and also reach areas that are inaccessible after the assembly. This might also be the stage to decide about which biocides to use on your log cabin. While keeping the wood dry is the most effective measure against fungi and insects, these chemicals provide an additional protection. A treatment against blue-staining fungi is sometimes recommended for conifers. If you have decided for a certain system of wood protection, often times there will be a primer coating, which you could apply pre-assembly and a finish to apply after the log cabin is built up completely. You can decide to use a UV-protection. You can also decide if you want to use a lacquer closing the wood completely or a treatment that keeps the timber breathable like oils or varnish. Depending on the kind of treatment you choose, the intervals for re-treatment may differ. Usually they might be between 5 and 10 years. If you follow the recommendations of your wood-treatment dealer, please keep in mind that they would rather recommend narrower periods to make some more sales. A thorough regular inspection of garden log cabins is always useful to assess the state of the wood protection, detect organisms, wet spots and also to detect possible damages of wood and lacquer. Also, keep in mind that repairs and refreshments are much more complicated when you have a thick final layer to cope with instead of a treatment that is soaked up by the timber. The latter does not require any grinding, sanding and cleaning the way thick, impenetrable layers of lacquer do.